Click here to email or call 410-602-3322 to book your MicroNeedling treatment now. Skin is beautiful when smooth, supple, clear and glowing. Acne scarring, pigmentation, fine lines and wrinkles and sun-damage take away the beauty of healthy skin. The loss of collagen and elastin is the main culprit for aging skin. Believe it or not, the skin starts to age at 30 years old when your body and skin biologically begin to slow down and the loss of collagen and elastin begin. MicroNeedling, also called Collagen Induction Therapy (CIT), is an exciting new treatment that works to enhance your collagen and elastin and reduce pigmentation, skin textures, fine lines, wrinkles and acne scarring. At The Center for Cosmetic Surgey and MediSpa in Baltimore, Dr. Dean Kane is proud to offer Microneedling with the SkinPen® that is the only FDA approved medical grade microneedle tool to help return your skin back to a healthy, smooth and clear appearance. Microneedling is a minimally invasive treatment that uses the SkinPen® to make miniscule needle punctures to create channeling within the skin. The purpose of these tiny punctures is to create a controlled injury to stimulate the body to heal itself by inducing collagen and elastin formation as well as cellular turnover. Microneedling has been scientifically proven to improve the health of the skin and create smooth, clear and firm skin. Microneedling combined with Platelet Rich Plasma (PRP) provides an even greater impact to the healing power of your skin. PRP is the process where just one syringe of your own blood is drawn by our nurses. Your blood is spun down to separate the Platelet Rich Plasma (yellow color) from the actual red blood cells. In the PRP (the yellow plasma) are your own high concentration of growth factors and platelets. The process involves using the SkinPen® to create these tiny needle channeling. This channeling is created by a very specific pattern on the face with the SkinPen’s precise controlled depth level of needles that penetrate into the skin causing these tiny holes. While the microneedling works alone to stimulate your collage and elastin, the PRP provides for an even greater stimulation and cellular turnover. The PRP is applied topically directly onto the open channels (the tiny pinpoint holes) so that the platelets are absorbed immediately under the skin providing an instant soothing and comforting sensation to the skin. The PRP is left on the face for a minimum of 4 hours while the nourishing effects of the plasma work to stimulate collagen and all important properties of the skin. There are minimal side effects and no potential for allergies because it is your own blood being used. Can I use Serums instead of PRP with MicroNeedling? If patients prefer to use serums instead of PRP, hyaluronic acid serums are ideal to be used with MicroNeedling. Hydrolyzed hyaluronic acid serums improves penetration and moisture to the skin. Hydration is key to preventing collagen and elastin degradation of the skin. Hyaluronic Acid provides instant hydration and smoothing of the skin. The hydration plumps the surface and helps the skin hold onto moisture. Maintaining moisture in the skin is key to achieving long term reduction of fine lines of the skin. Safe to perform on all skin types and skin color from light to dark tones. Minimally invasive with little downtime. Can be used on the face and all body parts. Can be done all year round. What are the Side-Effects of MicroNeedling? You can expect temporary warmth to the skin, flushing and pinkness. The pinkness will last for about 3 days. Topical post-treatment creams will provide comfort, reduction of inflammation and reduction of potential itching. 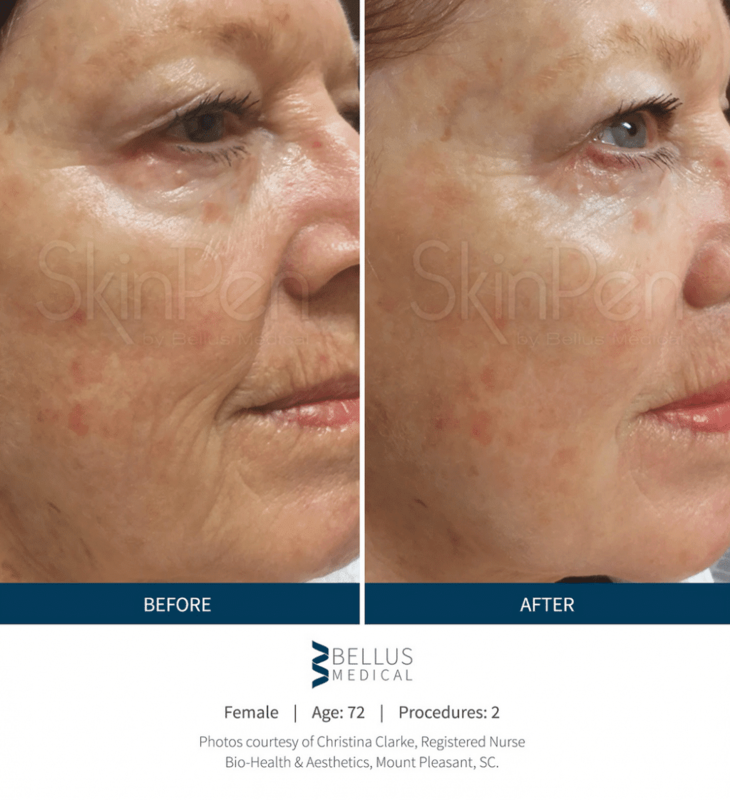 What skin issues can MicroNeedling effectively treat? What is so special about MicroNeedling is that individuals of all skin color and tone can be candidates for this Collagen Induction Therapy. Here in Baltimore, Maryland where we have a tremendous diversity of people from African Americans, Africans, Asians, Caucasians, East Indian, West Indies, Hispanics, Mediterranean and Middle Eastern all can be candidates for this type of procedure. Often times, laser rejuvenation procedures are not always appropriate for individuals of color. 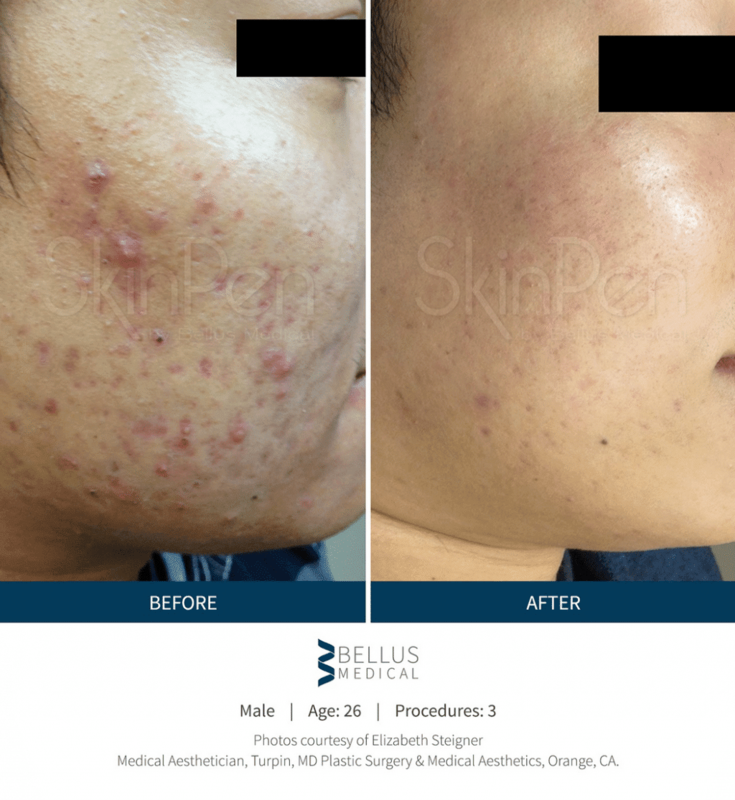 But individuals of all color who desire to correct the various skin issues as described above such as pigmentation, acne scarring, wrinkling and texturing problems can be safely treated with MicroNeedling. Unlike the home treatments that can be purchased on the internet, the SkinPen is a medical grade quality that can go deeper into the skin requiring a topical anesthetic to be applied to numb the area being treated. The numbing greatly helps reduce the feeling of the tiny needles penetrating. When the PRP is applied there is immediate comfort and relief from your own healing platelets. What can I expect after the treatment is done? The microneedling creates a sunburn-like pinkness or flush that lasts approximately 3 days. Within hours of being treated the warmth effect reduces to a minimum and by the next day the skin can have a slight itchiness. Post-treatment kits are given to every patient in which topical creams are used to soothe and reduce post-inflammatory responses. Most patients return to their natural color within 3-4 days. A very light flakey peel can occur during these 3-4 days. It is recommended to have three treatments done 4 weeks apart. Your skin will look healthier right away after each treatment looking smoother and more even toned. Final results are very dependent on your initial level of sun-damage, skin issues and general health of the skin. For most people the final results can take up to 3 to 6 months for your skin to naturally form the collagen and elastin. What is recommended to prepare my skin for MicroNeedling? 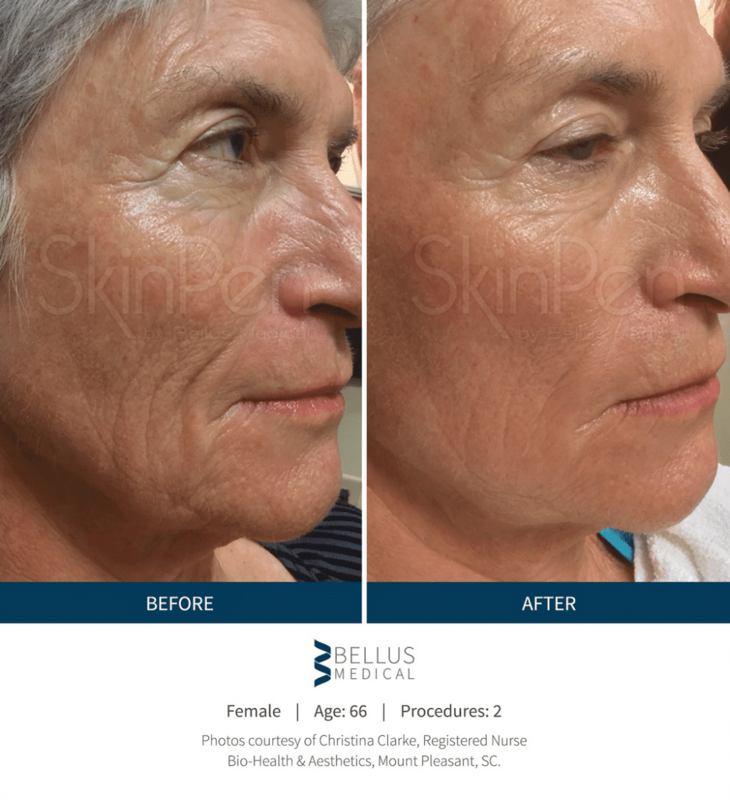 In our Center for Cosmetic Surgery and Medi-Spa, Dr. Dean Kane has developed a Skin Health program based on the philosophy, techniques and skin products from Dr. Zein Obagi. Through the use of tretinioin and hydroquinone skin products, Dr. Obagi developed the ZO Skin Health System. For all skin procedures that involve controlled dermal injuries to the skin, Dr. Kane requires that all his patients prepare their skin 6 to 12 weeks prior to the treatments. The goal of this preparation is to begin the process of cellular turnover, blood flow to the face and control melamin production to help prevent hyperpigmentation. This is particularly important for all patients of color who are at a greater risk of hyperpigmentation when any injury to the skin can cause an increase in their melanin production. The ZO Skin products will hasten the healing of the microneedling treatment and allow for ongoing stimulation of your collagen and elastin. The philosophy of the ZO Skin Health System is to stimulate continual cellular renewal and rejuvenation of your skin on a daily basis and to complement any treatments that are performed in our Medi-Spa. The ZO Skin Health System is also used post treatment of MicroNeedling so that your collagen and elastin continues to build toward beautiful healthy and glowing skin all year long. Who performs the MicroNeedling and PRP procedure? MicroNeedling is a medical induction therapy of collagen. Our highly trained nurses perform the MicroNeedling Procedure with PRP. As part of their training, our nurses understand the depth of the penetration of the needles and apply the appropriate depths depending upon the skin issues and concerns. The depths of penetration of the SkinPen with the medical grade can range from .25 to 2.5 mm. Unlike home-use devices that hardly penetrate beyond .2 mm depth. The other issues with home devices is that the needles are of poor quality that can cause more harm than good to the skin. In the office of Dr. Dean Kane, we take tremendous pride that you will always be treated with the very best professionally trained and carin staff. What are the costs for MicroNeedling with PRP or Serums? It is highly recommended to have 3 treatments done 4 weeks apart. The special pricing for the package of three MicroNeedling Treatments with PRP is $2250. If done as a single treatment the cost is $850. If you choose to use serums rather than PRP that the series will be $1650 and the single treatment with the serum would be $650. For anyone wanting just a targeted area of the face for example around the mouth, nasal folds and chin that would be $550 with a serum. How do I set up my appointment for MicroNeedling? If you are interested in MicroNeedling and new to our Center for Cosmetic Surgery and Medi-Spa please call us at 410-602-3322 or email Lauri@DrDeanKane.com to schedule your skin consultation. Your initial appointment will be set up with our highly experienced medical estheticians who will evaluate your skin issues and begin your skin treatment program to prepare your skin for the MicroNeedling. As mentioned above it is highly recommended that the skin be prepared before having the MicroNeedling therapy. Our estheticians will get your skin ready with Dr. Zein Obagi’s ZO Skin Health System as well as introduce you to our nurses who will be performing the procedure. Give us a call today so we can get you started on your path to beautifully clear, smooth and glowingly healthy skin.